Friday 12th October marks the anniversary of the death of Scots singer David Kennedy. Born in Perth in 1825, he obtained the post of precentor or leader of unaccompanied psalm singing at the United Presbyterian Church, Nicolson Street, Edinburgh. 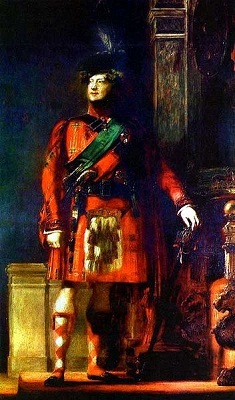 Following a series of concert tours in Scotland he made his first appearance in London in 1862. During his life he toured Canada, the U.S.A. Australia, New Zealand and Newfoundland. From 1876 to 1879 he toured England, Scotland and Ireland, including two seasons in London followed by tours of South Africa and India. The globe trotting singer who died in Stratford, Ontario in 1886 is commemorated on a plaque next to the steps in Regent Road leading to the Calton Hill. 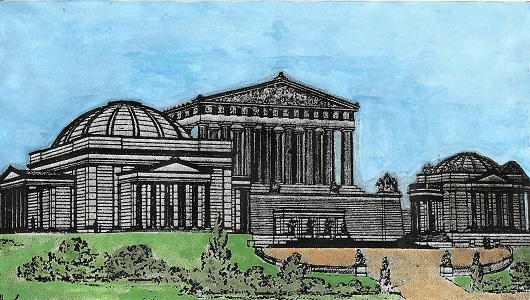 This week’s illustration shows ‘The Edinburgh Parthenon and The Scottish National Gallery'. In 1907 it was proposed that a concert hall be built next to the National Monument on the Calton Hill using £50,000 from the Usher Bequest. Andrew Usher the son of a whisky distiller had donated £100,000 to build a new concert hall for the benefit for the city. Although the hall was never built, three years later an architectural competition was held, Stockdale Harrison & Howard H Thomson of Leicester submitting the winning design. George V and Queen Mary laid the Usher Hall’s two memorial stones in Lothian Road on 19 July 1911. The event was attended by over one thousand people. 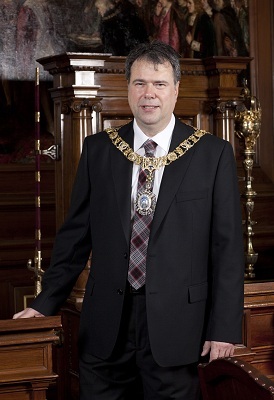 Donald Wilson the Lord Provost of the City of Edinburgh is very much aware of the importance of the city’s traditions, especially the history of the One o’clock Gun and the time ball on the Nelson Monument as his wide spread interests include computing and the mathematical sciences. Born in Selkirk, Donald Wilson attended Galashiels Academy. The Lord Provost has a BA (Hons) from Stirling University, an MSc in Information Science from the City University of London and a teaching qualification from Moray House. A former teacher of Computing at Newbattle Community High School, he has also served as an ICT Curriculum Development Officer and as an Adult Education Tutor. When he gets the time, Lord Provost Wilson enjoys reading books on science fiction, history, and listening to opera. An exhibition on the work of architect William Henry Playfair is now running at Riddle’s Court, 322 Lawnmarket, Edinburgh. Born in 1790, the architect designed many of the city’s buildings including the National Gallery of Scotland, the Royal Scottish Academy and the observatory on the Calton Hill. The architect was born in London, but after his father’s death, he was sent to live in Edinburgh with his uncle, Professor John Playfair, mathematician and geologist. William studied under William Starke of Glasgow. His first public commission involved the laying out of part of Edinburgh’s New Town. When the architect died in 1857 he was buried in the Dean Cemetery. The exhibition runs until 13th September. Photo credit: Edinburgh World Heritage. Saturday 1st September marks the anniversary of Queen Victoria and the Prince Consort’s visit to Scotland in 1842. When the royal yacht was spotted sailing up the Firth of Forth, a red flag was to be hoisted on the Nelson Monument and a salute fired from Edinburgh Castle, heralding the arrival of the royal couple. The flag was not hoisted which resulted in the failure of the Lord Provost and the city officials to meet the royal couple on schedule. 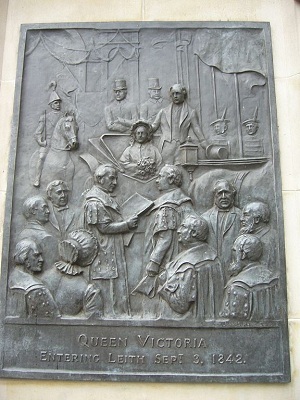 The bronze panel showing the Provost and city officials of Leith welcoming the royal couple can be seen on the plinth of Queen Victoria's statue at the foot of Leith Walk. 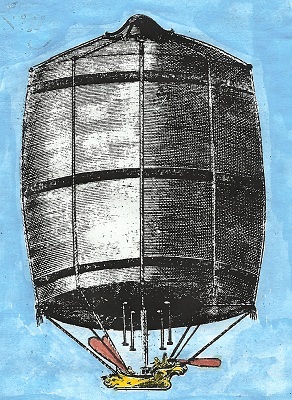 Saturday 25th August marks the anniversary of the U.K.’s first balloon flight by James Tytler. In July 1784 the inventor invited subscribers and potential investors to come along to Register House which was still in the process of being built to see the balloon which he had designed being inflated. The following month, taking off from Comely Garden to the north of the Calton Hill, Britain’s first successful aeronaut flew for half a mile at the height of 350 feet towards Abbey Hill. Wednesday 15th August marks the anniversary of King George IV’s visit to Scotland in 1822. As the procession made its way past the foot of the Calton Hill, it came to a halt, to allow the King to look down on the gold-capped turrets of Holyroodhouse. Hundreds of spectators standing on the Calton Hill sang ‘God save the King’ while the Royal Artillery’s guns fired a salute from Salisbury Crags. 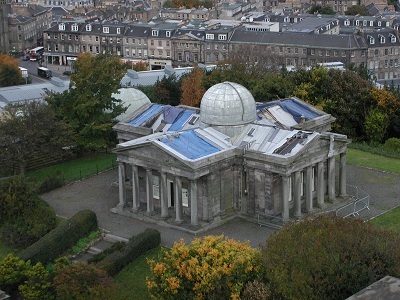 The observatory on the Calton Hill was designated the Royal Observatory following the King’s visit. Wednesday 18th July marked the 150th anniversary of the death of Master Gunner Findlay who along with Professor Charles Piazzi Smyth the Astronomer Royal for Scotland and Frederick James Ritchie the proprietor of James Ritchie & Son helped set up the One o’clock Gun. 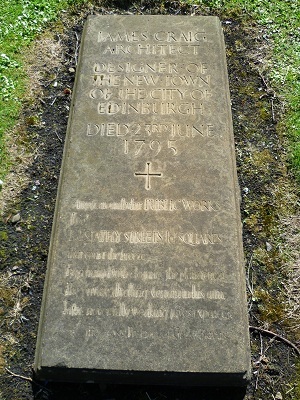 Master Gunner Findlay is buried in St Cuthbert’s graveyard at the west end of Edinburgh. The event will be marked with a small ceremony. 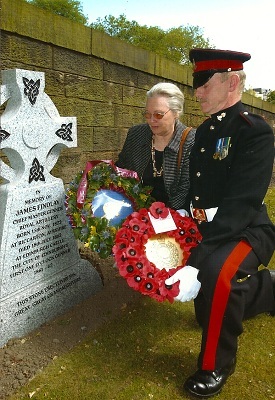 This week’s photograph shows Mrs Patricia Neish and Sergeant Shannon laying wreaths on Master Gunner Findlay’s headstone when it was unveiled in 2006. The talk given by Dava Sobel, author of the international best seller ‘Longitude’ at the National Museum of Scotland, was a great success. Competently presented by Professor John C Brown the Astronomer Royal for Scotland who opened the proceedings by mentioning the One o’clock Gun and the Nelson Monument time ball, the evening quickly flew in. Dava’s fascinating presentation on the work of John Harrison was followed by a time talk given by Dr John C Taylor who created the Midsummer Chronophage based on the work of the 18th century clock maker. Monday 2nd July marks the anniversary of the death of opera singer John Templeton. Born at Riccarton, Kilmarnock in 1802, he became precentor or leader of unaccompanied psalm singing at the Rose Street Secession Church, Edinburgh. Moving to London he studied under Jonathan Blewitt, Thomas Welsh, De Pinna, and Tom Cooke, before making his stage debut at Worthing in 1828 by appearing as Dermot in ‘The Poor Soldier’. In 1845 the Scots singer toured the U.S.A. John Templeton is commemorated on a plaque close to the steps in Regent Road leading to the Calton Hill which also features precentors David Kennedy and John Wilson. Saturday 23 June 1795 marks the anniversary of the death of James Craig the architect responsible for the design of the New Town. The Scots architect also drew up a plan for the Gothic Observatory on the Calton Hill. The observatory was to consist of an octagonal tower approximately 48 feet in height with East and West pavilions, but the architect Robert Adam suggested that the building should be designed to look like a fortress, with embrasures and buttresses. Although one of the corner towers was constructed, the money had run out, and the Town Council lost interest in the project. James Craig is buried in Greyfriars Churchyard. Monday 18 June 1815 marks the anniversary of the Battle Waterloo. An Imperial French army under the command of Emperor Napoleon was defeated by an Anglo-Allied force under the command of the Duke of Wellington and a Prussian army commanded by Gebhard von Blücher. The defeat ended Napoleon’s rule as Emperor of the French. 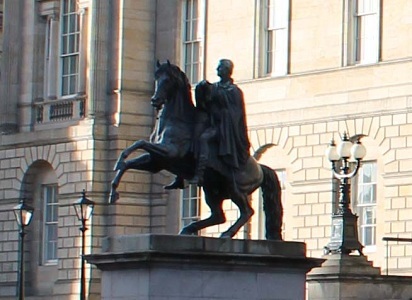 The Duke of Wellington’s statue designed by Sir John Steell stands in front of General Register House. Erected in 1852, the Iron Duke sits on Copenhagen, the charger he rode during the epic battle. 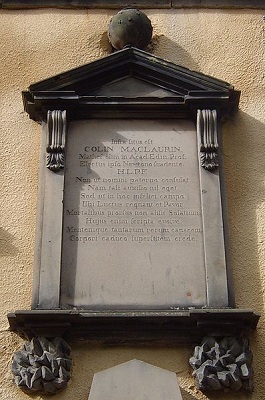 Thursday 14th June marks the anniversary of the death of Colin Maclaurin. In 1745 the Scots mathematician supervised the setting up of the city’s defences when news was received that the Jacobite army was heading towards Edinburgh. When the Highlanders entered the city, he left for York, but unfortunately fell from his horse during the journey. Returning to Edinburgh after the Jacobite army had marched out, he died soon afterwards due to the journey he had made after being forced to leave the capital. The mathematician is buried in Greyfriars Kirkyard. 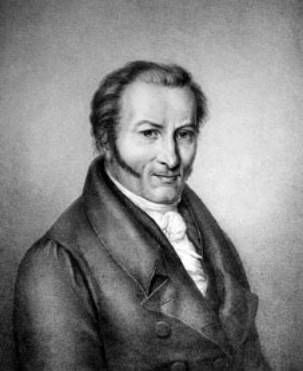 Thursday 7th June marks the anniversary of the death of Joseph von Fraunhofer. Noted for the discovery of the dark absorption lines known as Fraunhofer lines in the Sun’s spectrum, and for making excellent optical glass and achromatic telescope objectives, the Bavarian optician produced various optical instruments including the Fraunhofer Dorpat Refractor and the Bessel Heliometer used to collect data for stellar parallax. 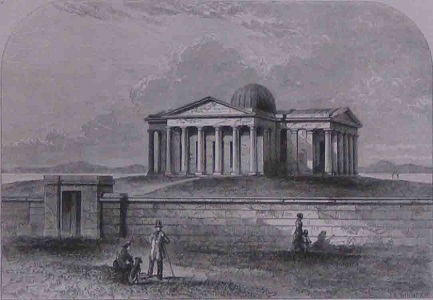 Possibly the last telescope objective made by Fraunhofer was supplied for the Royal Observatory, Calton Hill Edinburgh. The telescope was completed and installed by Repsold of Hamburg after the optician’s death in 1826. 15 Royal Terrace was the official residence of Charles Piazzi Smyth, the second Astronomer Royal for Scotland and Professor of Astronomy at Edinburgh University. The professor and his wife Jessie moved from Hillside Crescent to Royal Terrace in 1870. As he made full use of the first class vantage points at the top of the house to carry out his observations, he raised the roofline and the ceilings in the upper attic to make room for his telescopes. He also installed a lift to transport his scientific instruments to the top floor. The Piazzi Smyths lived at number fifteen until the professor resigned from the post of Astronomer Royal in 1888. Designed by James Gillespie Graham, the Chapel of St Mary’s in Broughton Street opened in 1814. The cloister chapel, next to the main building was destroyed when the gable end of the Theatre Royal collapsed during a fire in 1865. St. Mary’s became the pro-cathedral of the new Archdiocese of St Andrews and Edinburgh in 1878. Renamed the Metropolitan Cathedral in 1886, the cathedral has been enlarged and remodelled many times since it was built. Pope John Paul II visited St Mary’s during his pastoral visit to Scotland in 1982. 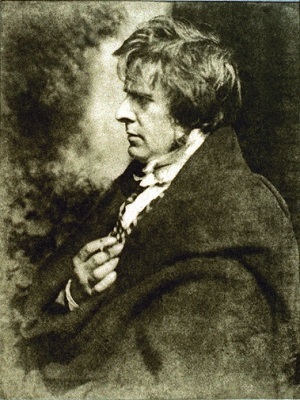 Thursday 17th May marks the anniversary of the death of David Octavius Hill. Born in Perth in 1802, the artist and his partner Robert Adamson produced a wide range of portraits depicting well known figures posing either in the studio or in outdoor settings such as Greyfriars Kirkyard. Over a period of four-and-a-half years, the partners produced nearly 3,000 images, using the Calotype process. The pioneers of photography developed their plates in their studio at Rock House which stands on the left hand side of the stone steps leading from Regent Road to the Calton Hill. Saturday 12th May marks the anniversary of the death of William McEwan politician and brewer. The founder of the Fountain Brewery served as a Member of Parliament from 1886 until 1900. 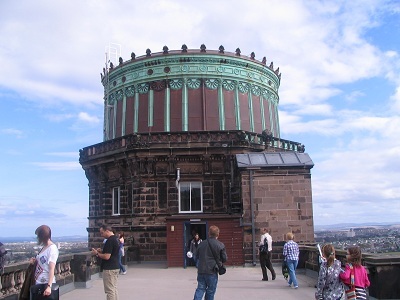 In addition to providing funds for the construction of the McEwan Hall on the south side of the city, he donated the 6-inch (15 cm) Cooke refractor standing in the dome of the City Observatory. 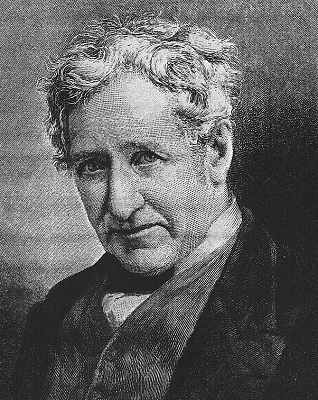 Monday 7th May marks the anniversary of the death of James Nasmyth. The Scots engineer learned his trade at Maudslay’s engineering works in London where he was employed as an assistant workman at the rate of ten shillings a week. When his employer died, James was taken on by Maudslay’s partner as a draughtsman. The co-founder of Nasmyth, Gaskell and Company manufacturers of machine tools, the inventor of the steam hammer retired at the age of forty eight, and moved to Penshurst, Kent to pursue his hobbies of astronomy and photography. Built to serve the residents of the Georgian terraces surrounding the Calton Hill, Greenside Church designed by James Gillespie Graham, opened its doors on Sunday, 6th October 1839. Civil engineer Robert Stevenson who designed and built twenty lighthouses in Scotland including the Bell Rock attended the church. His grandson Robert Louis Stevenson attended the church as a boy. In ‘Random Memories’, the writer referred to Greenside as‘The Church on the Hill’. Located on the rock face next to the steps on Regent Road leading to the Calton Hill, a small plaque commemorates Saint Wolodymyr the Great of the Ukraine. Born in 956 AD, Wolodymyr ruled an area stretching from the Baltic to the Black Sea and is credited with establishing Christianity in Russia. The plaque was erected by the ‘Ukrainians in Scotland’ Society in 1998 to commemorate one thousand years of Christianity in the Ukraine. Sunday, April 15th marks the anniversary of the death of Abraham Lincoln. His statue which stands in the Calton Cemetery was unveiled in August 1893. Although the Scots born soldiers are not buried in the cemetery, the names of Lt. Col. William Duff, Sgt, Major John McEwan, Private Robert Steedman, Trooper James Wilkie, Private Robert Ferguson and Private Alexander Smith who fought for the Union Army during the U.S. Civil War are chiselled on the plinth. Thursday 12th April marks the death of John McDougal Field who was appointed City Astronomer in 1925. He succeeded Sir William Peck the first City Astronomer. Both astronomers were interested in educating the public on astronomy and were responsible for introducing thousands of school children to the subject. When the Astronomical Society of Edinburgh was formed in 1924, John MacDougal Field was elected president. The City Astronomer died in 1937. This week’s photograph shows the hitching post which stands outside the old G.P.O. building in Waterloo Place. The post is said to have been used by troopers to tether their mounts when they trotted up from the cavalry barracks at Piershill to collect the regiment's mail. When a cavalry regiment was sent to Scotland, the squadrons were stationed at Piershill and Hamilton Barracks. The 17th Lancers or 'Death or Glory Boys' who took part in the Charge of the Light Brigade were stationed at Piershill Barracks in 1869. Built in a neo-classical Greek Doric style between 1826 and 1829 on the south face of Calton Hill, the Royal High School was designed by Thomas Hamilton. The building's portico and Great Hall are modelled on the Hephaisteion of Athens. Financed by the Town Council, King George IV donated £500 towards the £34,000 project ‘as a token of royal favour towards a School, which, as a royal foundation, had conferred for ages incalculable benefits on the community’. Alexander Graham Bell the inventor of the telephone attended the Royal High School and must have visited the observatory on a number of occasions. 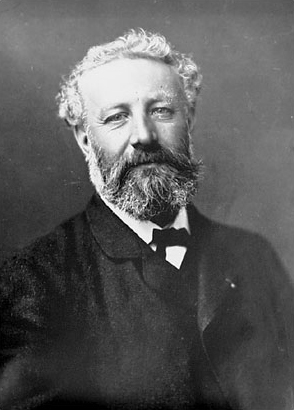 Saturday March 24th marks the anniversary of the death of Jules Verne. The science fiction writer who visited Edinburgh in 1859 described the Calton Jail as resembling a small-scale version of a medieval town. Although he was impressed by the view from the top of the Calton Hill, he did not like the design of the Nelson Monument. The author also visited Edinburgh Castle, Holyroodhouse and the beach at Portobello during his trip. Shops and offices were left without electricity last Wednesday morning when a power line was accidently damaged, possibly by contractors working on the city tram project. Properties affected included St Andrews House, the headquarters of the Scottish Government and the Balmoral Hotel in Princes Street. A spokeswoman for the Balmoral Hotel said that although power had been returned to the hotel, the hands on the clock-face remained at 9am, the time when the accident occurred. 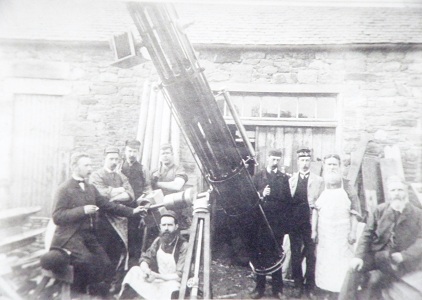 William Peck - Photograph courtesy of Dr, Ken Mackay, Stirling Astronomical Society. Wednesday 7th March marks the anniversary of the death of Sir William Peck. Born in Castle Douglas in 1862, the self taught astronomer was giving lectures to the public by the time he was twenty one. Elected a Fellow of the Royal Astronomical Society in 1885, he was employed by Robert Cox MP to run a private observatory at Murrayfield. Appointed Director of the City Observatory in 1898, he was knighted in 1917. Elected Honorary President of the newly formed Edinburgh Astronomical Association seven years later, the astronomer was buried in Warriston Cemetery, Edinburgh in 1925. 2012 marks the 110th anniversary of the Balmoral Hotel. 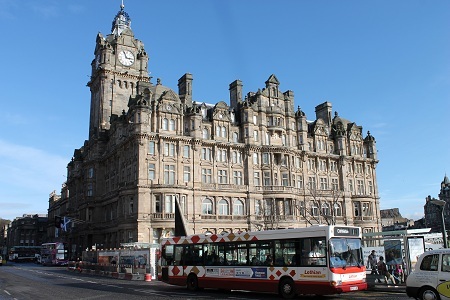 Opened in 1902, as the North British Station Hotel, the Balmoral Hotel which contains 188 bedrooms stands next to the Waverley Station. Designed by William Hamilton Beattie and A.R. Scott, construction began on the building in 1895. During the winter of 1897, the scaffolding erected around the building collapsed due to a severe battering by fierce gales.The hotel’s tower clock maintained by James Ritchie & Son is traditionally set two minutes fast to assist passengers catch their trains in time. The clock’s massive dial which measures 13 feet in diameter, while the minute hand measures six feet in length, can be seen from the west end of Princes Street. Friday 24th February marks the anniversary of the death of Thomas Hamilton who designed the Royal High School, Regent Road and the Scottish Political Martyrs’ Monument which stands in Old Calton Cemetery. The ninety foot high obelisk, funded by public subscription was erected in 1844 to commemorate political martyrs Thomas Muir, Thomas Fyshe Palmer, William Skirving, Maurice Margarot and Joseph Gerrald who were transported to Australia for demanding legal and parliamentary reform. Edinburgh World Heritage is now based at Acheson House, Bakehouse Close in the Canongate. The organisation which is charity funded through charitable donations, the City of Edinburgh Council and Historic Scotland has the role of conserving, protecting and promoting the city’s World Heritage Site. For further details check out www.ewht.org.uk/contact-us. Photograph courtesy of Edinburgh World Heritage. Wednesday 25th January marks the anniversary of the birth of Robert Burns. The poet would have visited the Calton Hill during his visits to the capital and may possibly have set his watch to the exact time at the window of the transit house which stands next to the Gothic observatory. The Burns Monument which stands directly opposite the Royal High School in Regent Road was designed by Thomas Hamilton the architect of the Burns Monument at Alloway. The Burns Monument overlooks the Canongate graveyard, where the poet's close friend, Mrs Agnes MacLehose, referred to in his letters and poems as ‘Clarinda’ is buried. In January 1822 a proposal was put forward for the construction of a national monument to commemorate Scotland's soldiers and sailors killed in action during the Napoleonic Wars. The appeal was supported by prominent Edinburgh residents including Sir Walter Scott, Henry, Lord Cockburn and Francis, Lord Jeffrey. In July 1822 the Royal Association of Contributors to the National Monument of Scotland was incorporated by an Act of Parliament. The foundation stone was laid by the Duke of Hamilton the following month. Sixteen months after the initial appeal, only £16,000 had been raised with the possibility of the Government awarding the project a £10,000 grant. Modelled on the Parthenon in Athens, the monument was designed by Charles Robert Cockerell and William Henry Playfair. Finally commissioned, work began on the building in 1826. Three years later the project was abandoned due to lack of funds. Born at Wremen, Hanover in 1770, Sunday 14th January marks the anniversary of the death of Johann Georg Repsold. 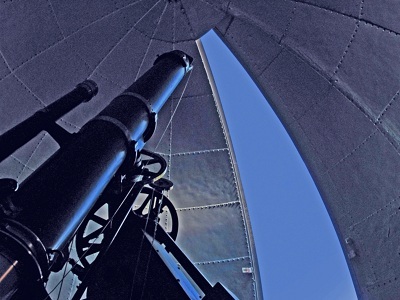 Interested in astronomy, he built an observatory in 1802 which was destroyed during the Napoleonic Wars. 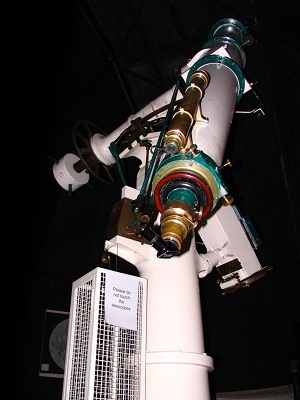 Setting up a workshop, in addition to supplying instruments for the observatories at Hamburg, Konigsberg and Pulkova, the firm made the transit telescope for the Royal Observatory on the Calton Hill. 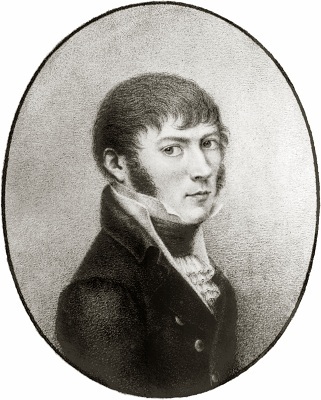 Johann George Repsold who was also firemaster of the Hamburg fire brigade was killed on duty when a wall collapsed during a fire in 1830. His son Adolf came to Edinburgh to set up the transit telescope in the observatory's east wing the following year. The Repsold Crater on the Moon is named after the instrument maker.